Explanation: Main belt asteroid 4 Vesta is at its brightest now. The small world is near opposition (opposite the Sun in the sky) and closest to Earth. But even at its brightest, Vesta is just too faint to spot with the naked-eye. Still, over the next few days it will be relatively easy to find in the constellation Leo, sharing a typical binocular field of view with bright star Gamma Leonis (aka Algieba). In fact on February 16 Vesta passed between Gamma Leonis and close neighbor on the sky 40 Leonis. Gamma Leonis is the brightest star in these two panels, while the second brightest star, 40 Leonis, is directy to its right. 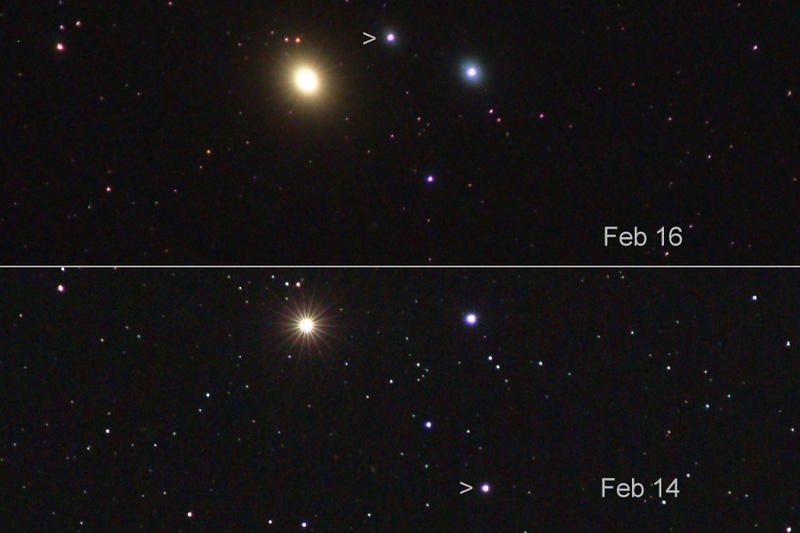 As marked, Vesta is the third brightest "star" in the field. Vesta shifts position between the two panels from well below 40 Leonis on Feb. 14 to near the top of the frame from Feb. 16, shooting the gap between the close Gamma/40 Leonis pair. Of course, premier close-up views of the asteroid will be possible after the ion-powered Dawn spacecraft arrives at Vesta in August of 2011.